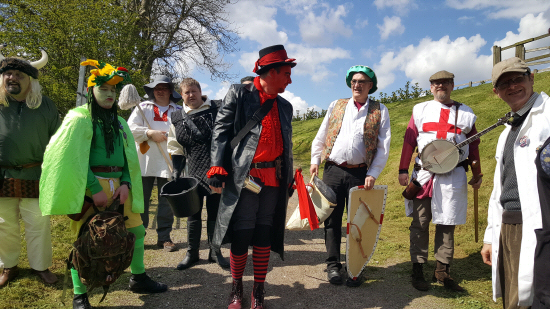 We’re really rather chuffed to confirm that we’ll be hitting a number of fine Nottinghamshire hostelries on Saturday 20 April 2019 with the CRAPPPS St George’s Play. [*] = start times dependent on bus timetables. We’re on public transport! Once again we’ll be aiming to raise a significant wodge of cash for charity and this year will be performing in support of Maggie’s Centre, Nottingham City Hospital. 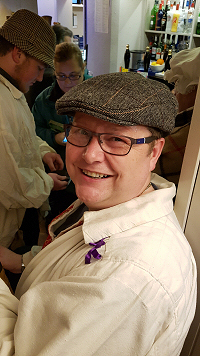 Maggie’s provides free practical, emotional and social support to people with cancer and their family and friends. It’s a brilliant cause, so please donate generously when the dripping pans come round. Also, remember to cheer loudly at that dead funny bit where St George stands on the dragon’s cobblers. 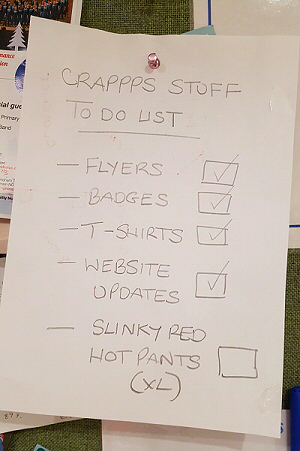 Back in March 2015 we revealed that CRAPPPS had raised circa £22k for charity since we took our first collection in 1979. Nearly four years on, a fresh look at Beelzy’s spreadsheet tells us that total funds raised by CRAPPPS have now exceeded £26k. 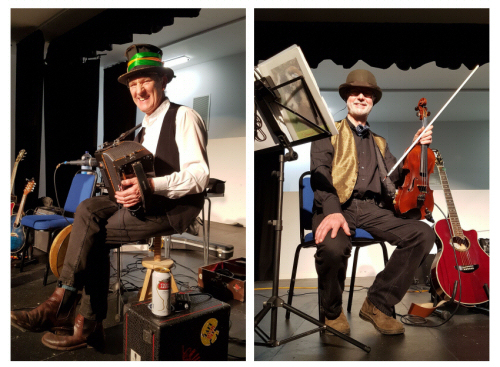 This figure includes record-breaking takings of circa £1.5k (above) raised for Nottingham NSPCC from the 2018 Plough Play run and 40th anniversary ceilidh hosted by the brilliant Sheepish Grin (John Crawford and Richard Mecia pictured below) at Calverton Village Hall. We’re very pleased to announce this updated figure and look forward to entertaining you for many more years to come. Huge thanks from us, to you, for your continuing support. 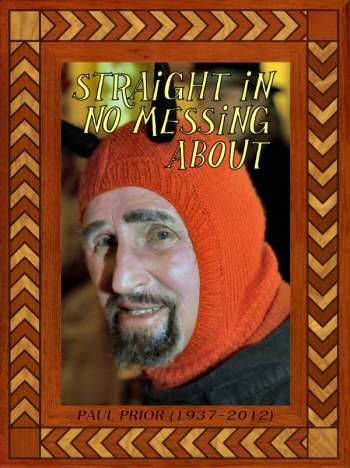 Ever wondered what this Plough Play thing is all about? You’re not the only one. Reviewer David Longford rather enjoyed one of our previous performances at The Woodlark in Lambley. Thanks to him for the following very kind words. 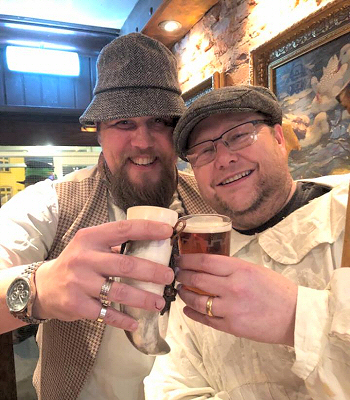 The Calverton Real Ale and Plough Play Preservation Society (CRAPPPS) have been perpetuating the tradition, routinely visiting local pubs around Calverton over three consecutive nights and performing this short, daft and entertaining piece. I enjoyed it enormously. It is unpretentious, basic, pure grassroots theatre. My enjoyment is aided enormously by sitting in the cosy confines of The Woodlark, with a roaring fire and Timothy Taylor’s Landlord on tap. And yet in watching this quirky little piece you can see how all theatre, whether it’s simple stuff like this or some of the grander pieces, is all inter-connected. 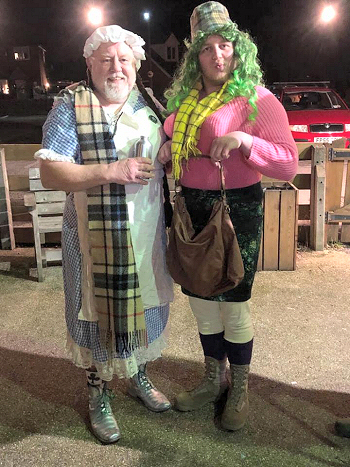 Men dressing up as women is not just limited to Panto and mumming can be dated back to Shakespeare’s time. Peter Quince, Bottom and the rest in A Midsummer Night’s Dream, with their crude and broad delivery are clearly a mummer’s troupe of sorts. If you are, huge thanks for opening your doors to us on 10 – 12 January 2019 – your hospitality is very much appreciated. In letting us entertain you, you’re helping to preserve a vital English tradition. Our group has performed a Plough Play every year since 1979, based on a script first written in 1890. You’re also helping us to raise funds for a great charity – Nottingham NSPCC. To that end, it would be amazing if you could try to get as many people in your pubs to watch us (and donate anything they can afford) as possible. 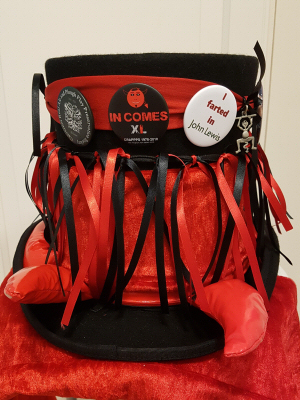 Every penny you place in our hats and dripping pans goes directly to charity. Every drop of ale we consume on your premises we pay for ourselves. We’re doing 17 shows at the villages and venues you see here. 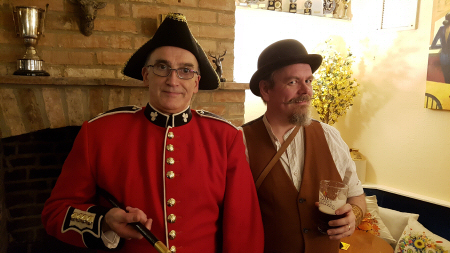 If you’re not a Plough Play pub, we very much hope you’ll bear us in mind for next year (and maybe drop us a line). January 2019’s CRAPPPS Plough Play is on its way with final tour dates listed below. Any changes to the schedule will be posted on this webpage, so check here first if you’re planning to come out to see us. The 2019 tour will see us undertake our 41st consecutive year of Plough Play performances. The first ever run took place in 1979. 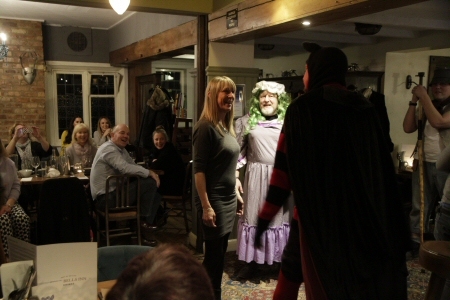 Proceeds, as ever, will go to Nottinghamshire NSPCC. 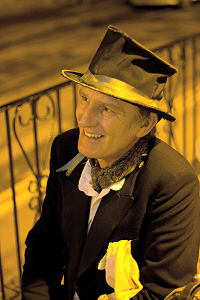 Bold Tom (Calverton revival version) and his entourage of oddly-dressed comrades first knocked on the doors of pubs in Calverton, Notts, and its surrounding villages in January 1979. 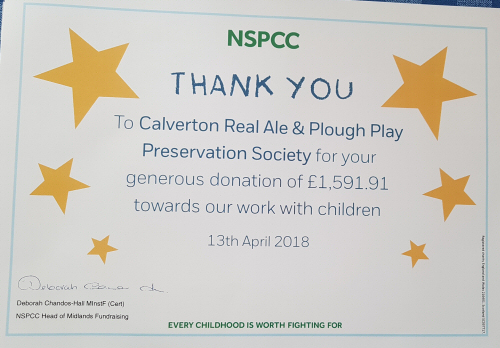 In January 2018, the Calverton Real Ale and Plough Play Preservation Society (CRAPPPS) performed its 40th consecutive annual tour of Plough Plays, fondly recalling the contribution, enthusiasm and dedication [*] of group members past and present and local legends absent, beloved and never-to-be forgotten. The group has seen numerous changes in personnel over the years. 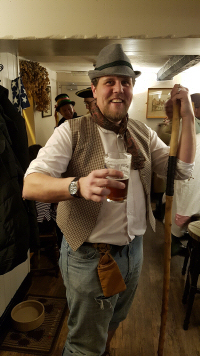 It has seen triumph and tragedy, hurrahs and heartbreak, fair weather and foul – but has persevered nonetheless with this glorious owd folk tradition with a spring in its step, ale in its belly and pride in its heart. Somewhere in the middle of all of it, CRAPPPS has raised nearly £30,000 for children’s charities. It’s also added a new Calvertonian tradition (the St George’s Play) to its canon, now in its 8th year of touring and going strong. 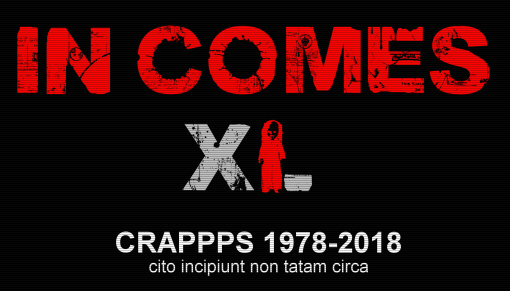 So we’d like to invite you to a right owd knees up at Calverton Village Hall on Saturday 17 March 2018 to celebrate – er, well all of the above – and to raise a glass to another 40 years on the road for CRAPPPS. 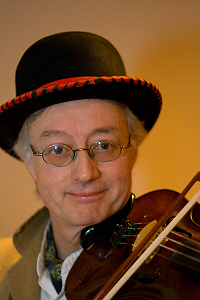 It’ll be a foot stomping, toe-tapping ceilidh with the brilliant Sheepish Grin (John Crawford and Richard Mecia – pictured above) presiding. 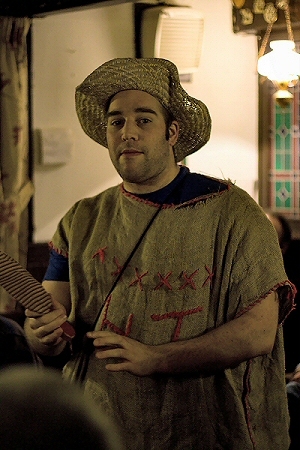 There’ll be mumming, merriment and memory-laning. All proceeds from ticket sales will go to Nottingham NSPCC. So … in comes you? Tickets now on sale (£8 adults / FREE for under 15s) – you can ring 07491 644581 to book or book online here. [*] = surely ‘medication’ – Ed.